Razor Scooters Now All About Vandalism And Starting Forest Fires | OhGizmo! At the height of their popularity it wasn’t uncommon to see even business types in suits riding Razor scooters to work. And while the fad hasn’t completely passed, it’s apparent the company is now trying everything they can to keep attracting kids’ attention- particularly young vandals and pyromaniacs. Their Graffiti scooter has a patented ‘chalk scribbler’ on the back which lets the rider lay down a set of parallel chalk lines while rolling down the street. I suppose it can be a handy way for kids to find their way home if they suffer from a poor sense of direction, but let’s be frank here; it’s really just a way to make vandalism seem like fun. But it’s their eSpark scooter that has me really concerned. Instead of pieces of chalk hanging off the back it’s got a ‘spark bar’ letting riders leave behind a trail of incendiary sparks. One trip through Yellowstone National Park on the wrong day and you’ve got a disaster on your hands. 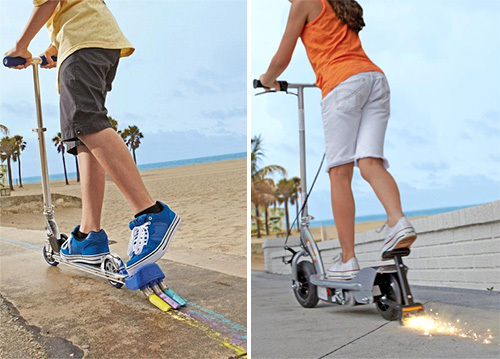 What’s even worse is that this scooter is electric powered, providing arsons with an effortless means of escape since on a single 8-hour charge it can run for about 40 minutes with a top speed of up to 10mph. $59.99 for the Graffiti, $179.99 for the eSpark. I even had this old Dreamcast game that was basically Tony Hawk on Razer Scooters, but with cartoon-y hipster characters. Oh god, why did I have that? I think both scooters don’t need anything like a color brake or a spark brake to be useful. I think what they can use is the typical brake material for bicycles. It’s cool man. We’ve all been there. I really thought razors were cool for a whole week when I was younger. It’s a time I try to forget, but without counseling – it’s been difficult. Um, Vandalism *is* fun … but the sparks one is just plain stupid. Kids + Fire (and no way to guarantee supervision) = Damage.